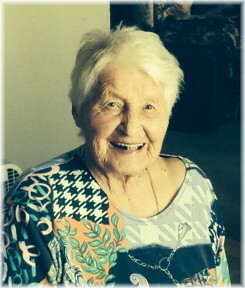 It is with great sadness we announce the passing of our beloved mother, grandmother, great-grandmother and sister Wanda Mary Naurocki on April 13, 2018 at the Beausejour Hospital. Wanda was born in Beausejour on August 13, 1929, the daughter of Louis and Mary Pirozek and sister to Stanley, Walter, and Victoria. As a young girl, Wanda helped with the farm chores and in her mid-teens worked in a sewing factory in Winnipeg. Wanda would always return to the farm on the weekends to help. Later on, Wanda met Wilbert Naurocki whom she married. Together, they had five children. Wanda remained on the farm, raising her family and working alongside her husband as they farmed. Mom had a strong work ethic, performing many tasks outside the house. Mom took a lot of pride in her large garden that she planted yearly. In later years, Mom, alongside her brother Stanley, returned to their passion of music and songs. Mom is survived by her children, Bertha Mikoluff, Roy (Sharon) Naurocki, Wade (Kathy) Naurocki, and Tracy (Bruce) Modrzejewski, her grandchildren Crystal, Kim, Renee, Jason, and Lisa, great grandchildren, Mackenzie, Rogan, Jett, Jasper and Ben, brother Walter (Linda), sister Victoria and sister in-law Margaret. Mom was predeceased by her parents Louis and Mary, husband Wilbert, daughter Sharon, brother Stanley and son in-law Norman Mikoluff. Special thanks and gratitude to Dr. Nick Van Rensburg, nurses and staff at both Beausejour Hospital and East Gate Lodge Personal Care Home (Crocus) for their kindness, love and care for mom. Funeral service will be on Wednesday, April 18 at 11:00 a.m. at Sobering Funeral Chapel, 1035 Park Avenue E., Beausejour with viewing one hour prior to the service. Interment will follow in Polish National Cemetery. In lieu of flowers, donations may be made to East Gate Lodge. My sincere and deepest sympathy is extended to Bertha, Roy and Tracy and their families, upon the loss of their dear Mom. I regret not being able to attend Funeral Service due to a long awaited-for Drs. Appt. , MY thoughts and prayers will be with you all. Deepest Sympathy to Wanda Naurocki’s Family.A tribute was given in honor of Wanda at the Dream Catchers Band concert held at the Beausejour Legion on Sunday April 15.Her lovely voice will now be heard in Heaven.Rest in Peace Wanda. So sorry to hear of the passing of your Mother. Our thoughts and prayers are with you all during this sad and difficult time. Our most sincere condolences to the Naurocki family. To each and everyone we send our love. God Bless. Our sincere condolences to the Naurocki family. We met your Mother through our shared love of music. She will be missed by many. So sorry to hear about the passing of your mother, I have many good memories of time spent in the kitchen and around the table with her. She was a wonderful lady. Sincere condolences. We are so sorry to hear of your mom’s passing. Our thought are with you at this time. We are very sorry to hear of your mom’s passing. Our prayers and thoughts are with you at this difficult time.